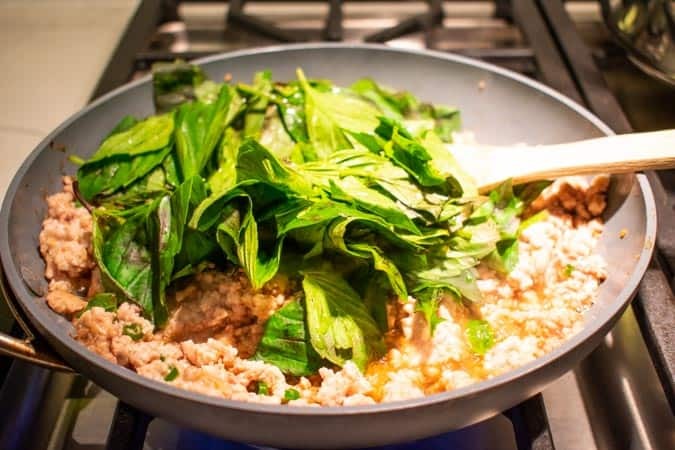 Thai basil chicken is traditionally made with holy basil, pictured. Though common in Thailand, it can be an almost sacred find elsewhere. It’s Thai, why wouldn’t you need Thai basil? Because it’s too hard to find. Holy basil – The traditional basil used in Thailand for stir-fried dishes but is extremely hard to find in the US. Thai basil – Less hard to find and usually available seasonally in the summer. Used for soups in Thailand rather than stir-fries. Tinged with purple streaks so you can tell the different. Italian sweet basil – Easy to find year round. If Italian sweet basil is your only choice, it works. It’s not quite as peppery and lacks some licorice qualities of Thai basil but certainly a doable substitute. Basil is an extremely common fresh herb found in many grocery stores. Why not do something different with basil besides a tomato sauce, pesto, or caprese salad? 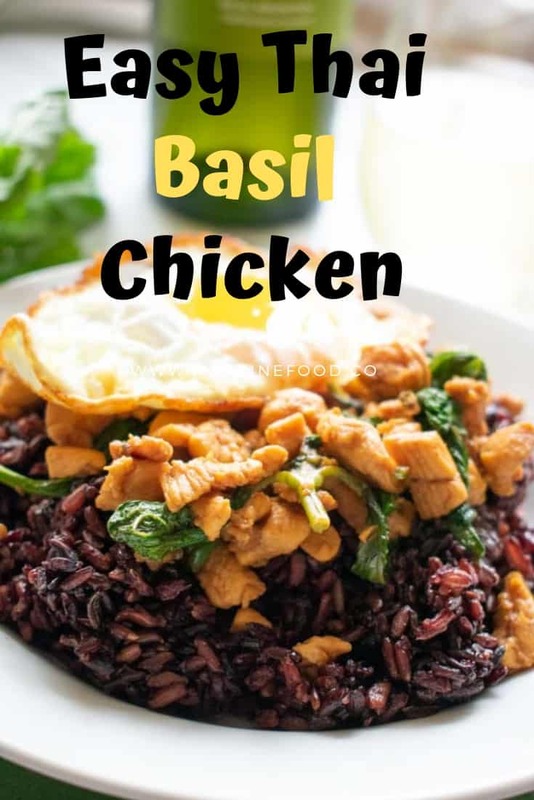 How is Thai Basil chicken seasoned? 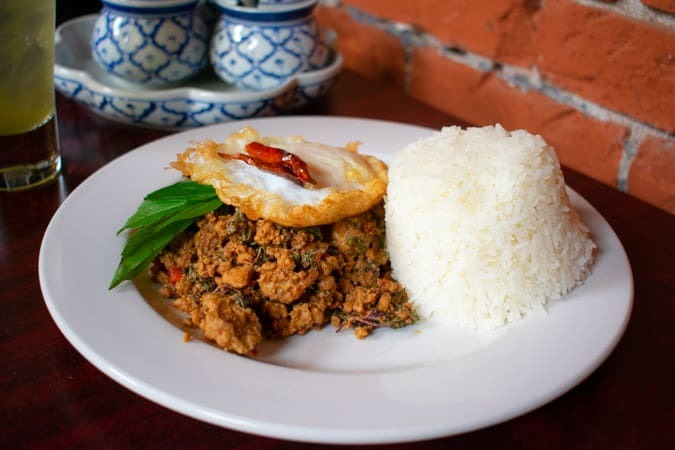 The Thai basil chicken at Soi 71 restaurant in Walla Walla, WA is made with a spicy chili paste ground by Grandma Dang herself and served with a fried duck egg. 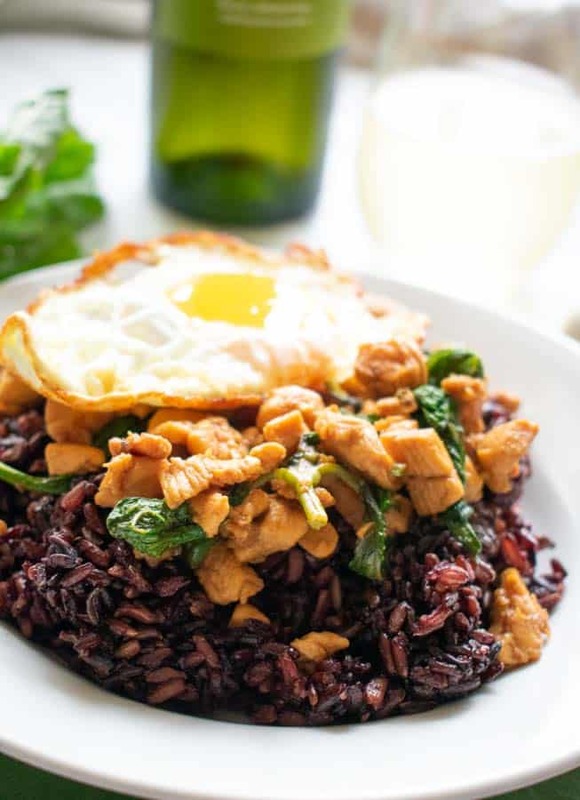 Instead, this recipe takes inspiration from the Thai Basil chicken served at Soi 71, a restaurant in Walla Walla, WA. It wasn’t just spicy, it was Thai SPICY. It seemed to have a combination of fresh and dried chiles, in addition to a curry paste ground by Grandma Dang, the proprietor and head cook of the restaurant. As a result, this recipe uses fermented shrimp paste, an ingredient found in most curry pastes. 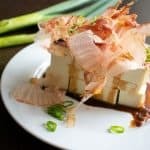 It provides a hefty bump of umami, salt, and savoriness to the dish. 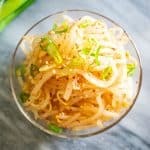 If you don’t have it, you can add sub with fish sauce. The sweet soy sauce is thick and dark like molasses and makes everything mahogany brown. If you don’t have it, additional soy sauce can be used. The chicken will just be lighter in color. Oyster sauce is also used in this recipe for a combination of soy sauce and seafood flavors. It really makes anything taste good. For spice, 1 serrano chile or 3 Thai bird chiles per pound of chicken adds enough heat to feel warm but not get burned. Traditionally, the chicken would be minced by hand with a combination of white and dark meat. In that case, ground chicken works fine. Ground turkey is a fine substitute too. The mouthfeel is just less toothsome with ground meats. If you do feel up to it, hand chopping chicken thighs into a 1/4 – 1/2″ dice would be ideal. Then you get a little more to chew on, and the appearance is just a tad bit more appealing. Thai basil chicken does not usually have other vegetables in it. It’s just basil and chicken. You could add bell peppers, carrots, and onion if you wanted, but the true version does not have those additions. Cherry tomatoes would also marry nicely with the fresh basil. 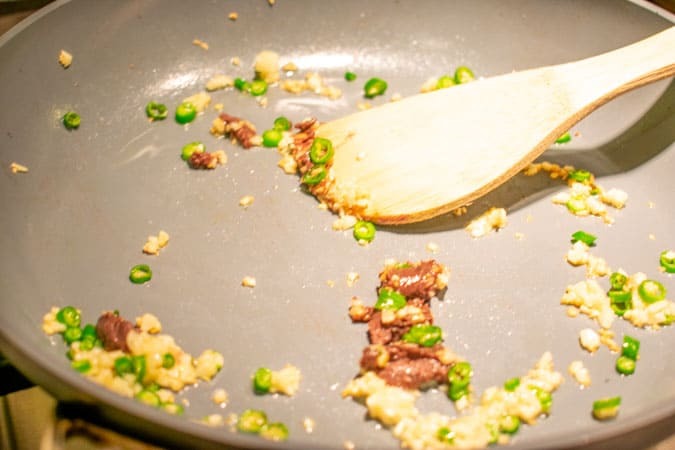 This dish is often served with a fried egg. This would also be a good opportunity to try frying a duck egg too, if you come across them at the farmer’s market. Give these a whirl in a hot pan with some oil for 30 seconds to a minute. Warning: cooking shrimp paste and chilies in hot oil emit very strong fumes. Turn the fan on high and stand back! Add the chicken, oyster sauce, and sweet soy sauce and cook for 3-5 minutes until the chicken is just about fully cooked with no raw pink spots left. Add the basil leaves and black pepper at the tail tend of cooking just to heat through. We don’t want to cook the basil leaves too much, to retain their freshness. Add black pepper to taste if you please, especially if using Italian sweet basil, this will heighten the peppery notes found in Thai basil. Serve with rice or just cauliflower rice if you’re on a low carb diet. Why not serve directly from the skillet too. Top with fried eggs, and do that “breakfast for dinner” trend. 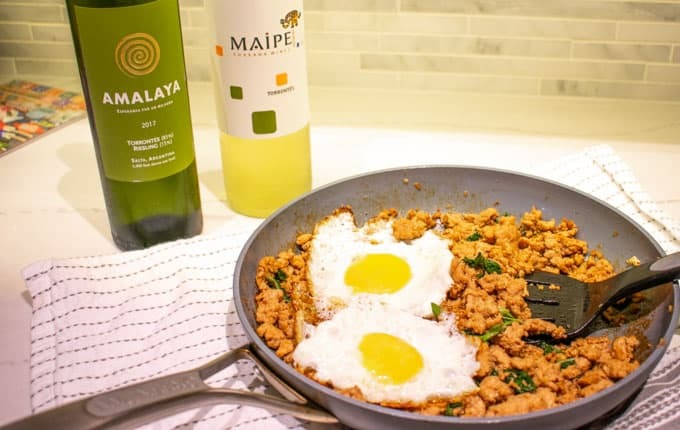 Thai basil turkey served with a selection of Argentine Torrontes wines. The recipe works just as well with both chicken and turkey. We know that the default pairing for Asian food is Riesling, but Torrontes must be a close second and honorable mention. Torrontes is an Argentine white grape varietal known for its floral, sweet aromas but salty, dry taste. You might call it two-faced. According to Wine Folly, the best Torrontes wines come from the high elevation Salta Vineyards. At 5,900 feet above sea level, the grapes get more sun exposure, particularly to UV-B radiation and you get fresher tasting wine. Since labor costs are much lower in Argentina, you also get a bargain priced wine. This Amalaya is a label from the Colome winery, started by Donald Hess. The same Hess who makes the Hess Collection wines in Napa. The same Hess winery in Napa where you can taste wine and also view millions of dollars worth of artwork. He since moved to Argentina and came out of retirement in 2002 to start making wine again. There you have a world class winemaking techniques applied to high elevation, organically cultivated grapes for just $12. This Torrontes has 15% Riesling that adds some much needed acidity to sun drenched wine grapes. It also lends a touch of minerality. 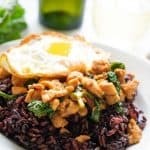 This Thai Basil chicken is made with hand chopped chicken and served with Thai black rice mixed with brown jasmine rice. 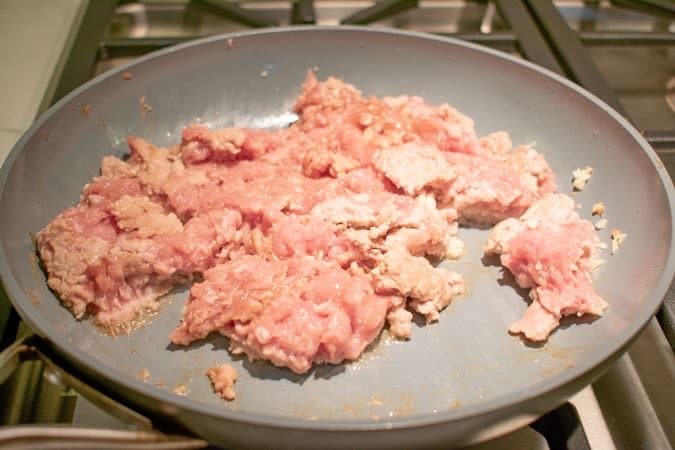 Instead of using ground chicken, you can chop the chicken into tiny bite sized pieces. It works because it doesn’t compete with spice and instead soothes it. Almost like lime juice, it provides a bright and refreshing contrast to the strong shrimp paste and oyster sauce seasonings. 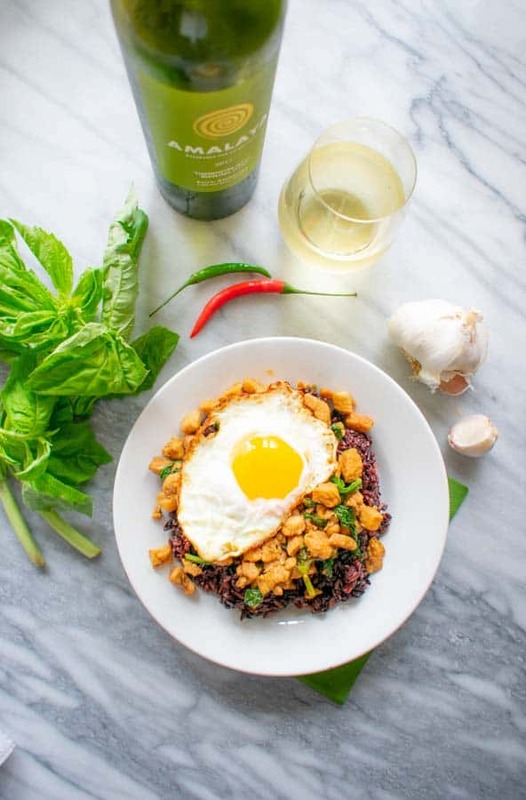 However, the wine also has that fully ripe, sun-drenched ripeness to it that marries with the herbaceous, fresh Thai basil in the chicken. 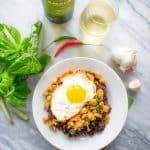 Both the Thai basil chicken and Torrontes wine are neither extravagant but rather humble in their means. You could easily make a date with these two on any night of the week without breaking your wallet or taking too much time. Don't let the lack of Thai basil deter you from making this dish. It works with regular Italian sweet basil too. It's quick, easy, and provides an alternative use for fresh basil besides tomato sauce. Heat oil over medium heat. Add garlic, chiles, and shrimp paste. Cook for 30 seconds to one minute, stirring so they don't burn. Add chicken, oyster sauce, and sweet soy sauce. Cook and stir for 3-4 minutes until chicken is almost completely cooked through. Add basil leaves and black pepper. Stir until leaves are wilted about 1-2 minutes. Chicken should have no pink spots left and be completely cooked through. P.S. Do you love Asian chicken dishes? Please spread the Asian ♥ and share! Your Thai Basil Chicken looks and sounds delicious. 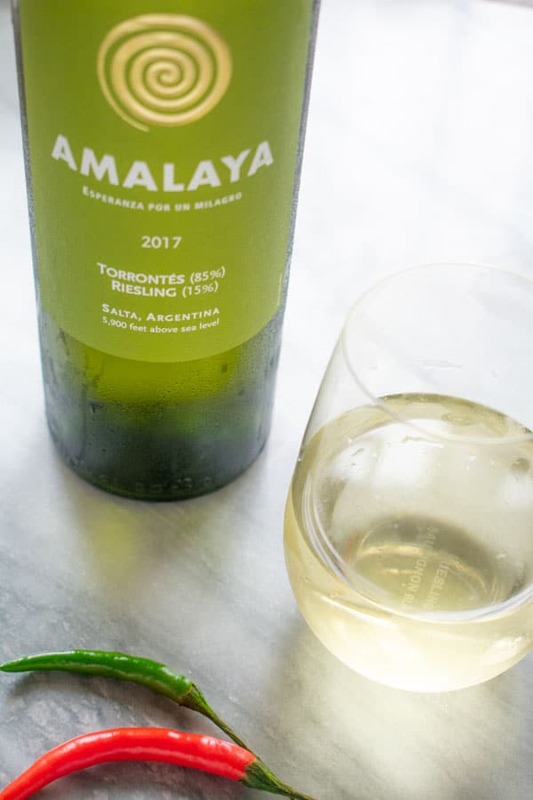 I am very curious to try the Amalaya Torrontés Riesling Salta. I did not know Donald Hess started Colome Winery in Argentina. Thanks Jane! Yes, it was a nice surprise to learn about the wine and Donald Hess living in Argentina. Hope you’re able to find the Torrontes! Looks like a wonderful dish. And what an interesting blend, the ripe Torrontes with a touch of Riesling. Cool! Thanks Jeff! Yes, it is a great blend! This is an awesome recipe. Thank you for sharing. I am going to save it and try to make it at some point. Thai Basil is not hard for me to find, but Thai chilis – serano will work. Thanks Michelle! That is so sweet to hear that you’d like to make it, and even better that Thai Basil is not hard for you to find! I can hardly wait to try this recipe. I see so much that is familiar from other recipes I’ve made. I bet the Torrontes was a cooling partner for your meal! Thanks Nancy! So great to hear that it’s similar to other recipes you’ve made! This recipe sounds delicious. I wouldn’t have though about Torontess but that pairing would be perfect. Thanks for all the tips for making Thai Basil Chicken! 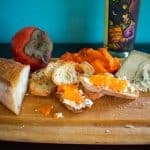 Great looking recipe! And I bet that Torrontes paired well! Thanks Martin! Appreciate the feedback! Mmm, looks like a delicious pairing! I will have to keep Torrontes in mind as a pairing for spicy Asian food. 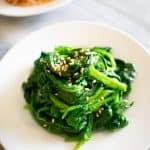 Wow-this delicious, spicy recipe is one I’ll definitely try! And with the Torrontes, it’s a sure winner! Thanks for this! Your dish sounds delicious! What a fun pairing! 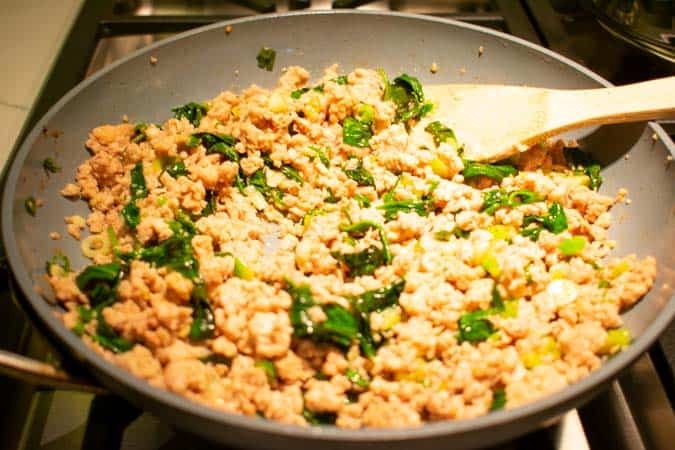 This thai basil chicken looks delicious!